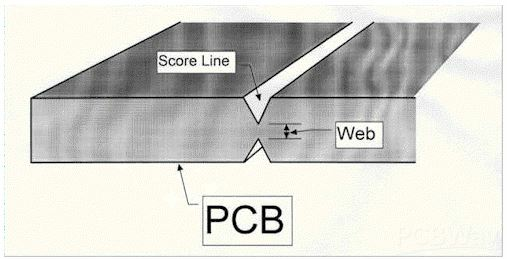 Also named as V-grooving or V-cutting, V-scoring is way to split circuit boards. It is cutting a "v" groove on the top and bottom of a circuit board while leaving a minimum amount of material in place to hold the boards together.
? The spacing between boards is 0mm.
? Minimum pcb size for V-scoring is 75 x 75mm,maximum size is 450x1245mm.
? V-scoring line must be straight and have to be vertical and horizental line.
? 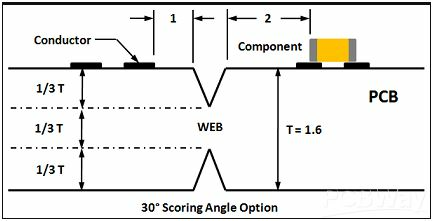 The spacing between V-scoring line and out line keeps at 0.35mm.
? We recommed board thickness of V-scored board is 0.6mm at least. Kindly note V-socring angle is 30 degrees.